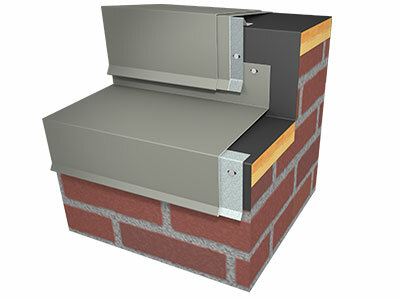 Ledge Caps | Metal Edge Systems | ATAS International, Inc.
Ledge Caps cover the top of brick ledges or other projections, and can be flashed to the wall or under the face of a coping or fascia above. ATAS’ Ledge Cap includes a continuous 22 ga steel cleat pre-punched with slotted fastener holes, and a pre-punched cover offered in a wide variety of materials, gauges and colors. They are provided in 12’-0” lengths, with interior splice plates, and ring shank nails for a complete installation. In addition to our full line of stock standard items, ATAS International offers a wide range of custom fabrication capabilities to fit any project’s needs. Radiused sections and accessories including miters, T-miters, end caps, and end closures are available for all perimeter edge products. Options include fabricated and sealed or welded and PVDF painted to match. Available in over 30 PVDF stock colors, our products come equipped with industry expertise and technical support, including design and development assistance, product specification guidance, and installation support.